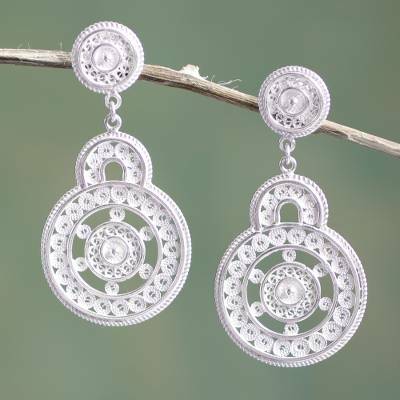 Ornate Peruvian Sterling Filigree Earrings, "Love Goes Around"
Giuliana Valz-Gen creates wheels within radiant wheels. Exquisitely handcrafted in sterling in the style of Catacaos, these earrings showcase the Andean art of silver filigree. You can find sterling silver filigree earrings 'Love Goes Around' by Giuliana Valz-Gen in jewelry categories such as No Stone Earrings, Silver Earrings, Sterling Silver Earrings, Filigree Earrings and Dangle Earrings. Enjoy exploring these sections for other Novica treasures. Beautiful silver work, and eye catching. Very light, so I can wear them all day!